I’ve watched my niece Olivia once day a week for the last couple of weeks and it’s been so much fun, with a few meltdowns thrown in, but mostly a lot of fun. I was very a little nervous about keeping Livi because I wasn’t sure how Lily would do. I’ve watched Livi before a number of times, but this time I’m keeping her at our house rather than at my Grandma’s house and I wasn’t sure how Lily would take someone else on her turf. Livi’s been here twice now and for the most part Lily LOVES it. Lil talks about “her new friend OliviWa” for days after and is quite unhappy when Livi leaves. I don’t get nearly as much work done as I normally do, but I make up for it after she leaves or the next day. It’s so worth it and again this one of the biggest reasons I’m sad about moving (I promise there’s a post about this in my drafts). I grew up really close to my cousins and have always wanted that for Lily. It’s taken her a year, but she and Livi are friends now, I don’t want her to loose that. Anyway back on track. The last time that Livi was over Lily slept terribly the week night before and (my sister) Jolene brought donuts for breakfast, Lily and Livi shared one. I should stop here and remind anyone that doesn’t know, that we limit Lily’s sugar intake to almost nonexistent. About a hour and a half after the donut Lily had a meltdown of epic portions, it took me a few minutes to figure it out, but as soon as I took her in the kitchen and gave her something to eat (toast) she was fine again. 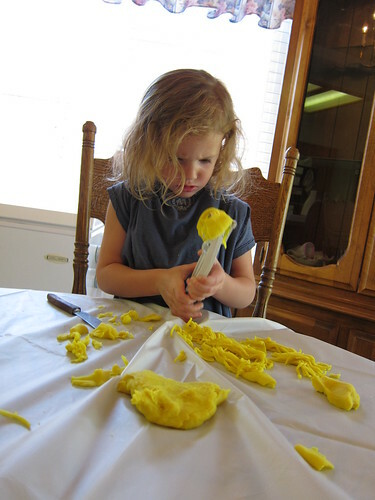 While we were in the kitchen I decided that we should make some playdough and have some fun. I pulled Lil’s Learning Tower up to the counter and showed Livi what it was for. 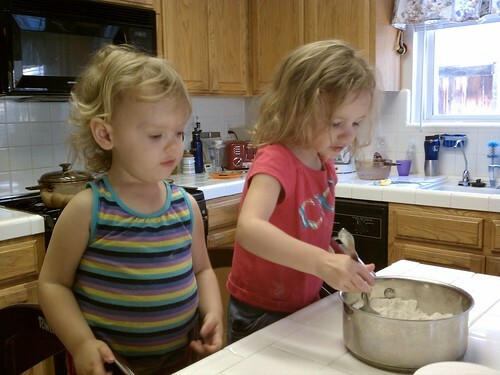 I let each of them dump one of the major dry ingredients into the pan, Lily is a pro at this. Then let them each take a turn at stirring before I put the hot water in. 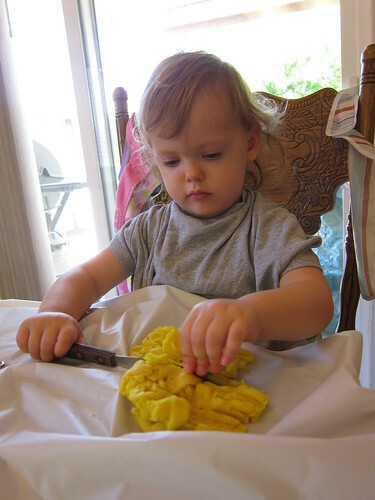 While the playdough was cooling we set the dining room up for messy playing with my standard crafting covers. 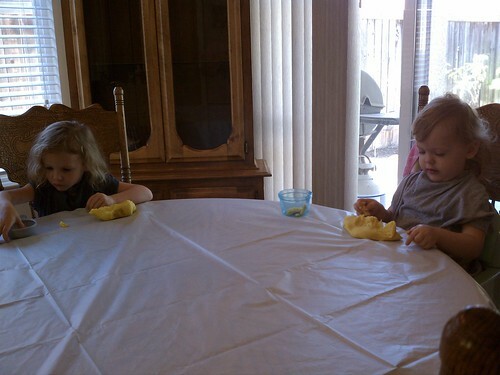 I put a leftover birthday party, cheap, plastic tablecloth on the table, and my old t-shirts on the girls. Because they are my t-shirts of course they are WAY too big so I gather up some of the excess material at the back of the neck and twist it a little and clip it with a pampered chef clip. It works great. 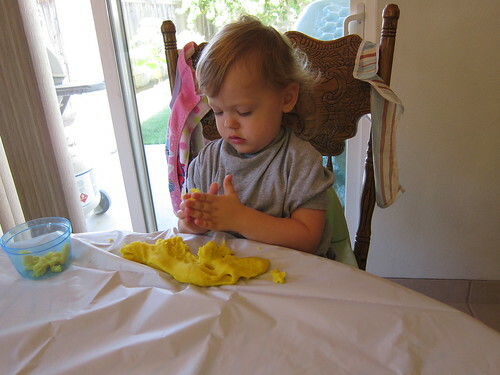 At first they just used their hands and the one play kitchen item they each had for some reason with the playdough. 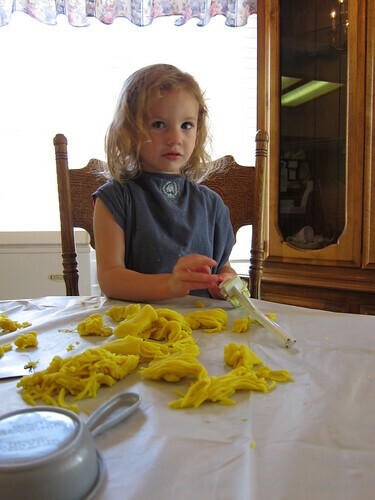 After a while Lily started asking for our normal playdough mashing devises. 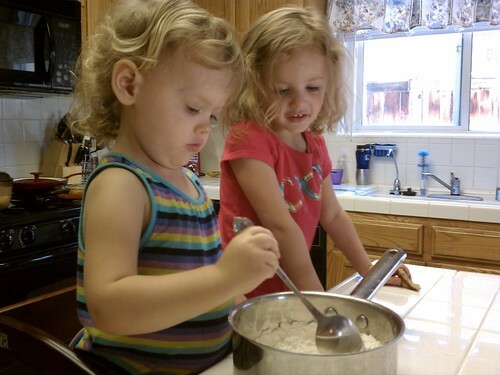 I also give them a potato masher and a old garlic press. 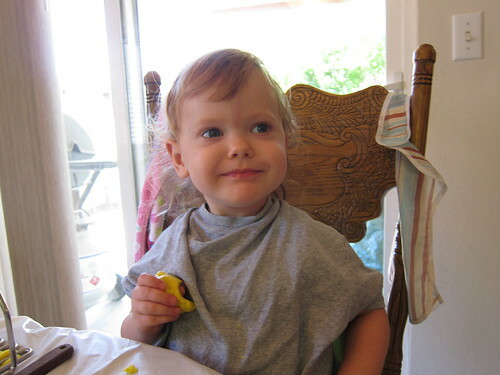 Lil loves the garlic press and had the first go with it. 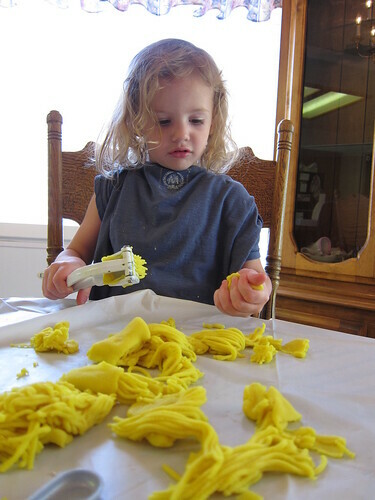 As soon as Livi saw the neat sketti noodles it produced she had to try it. 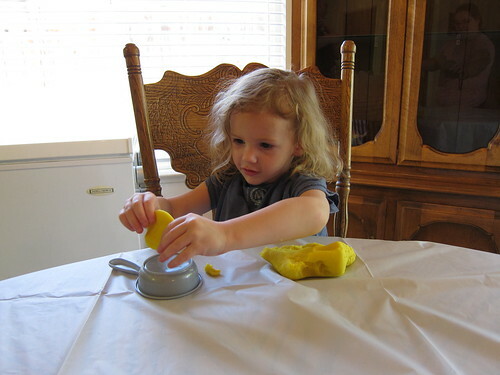 It took her a little trying to figure out the right ratio of dough and force, but she LOVED it. I'm pretty sure she's using "the force" to make this bend to her will. I'm sure she's wondering why I keep taking pictures. Just look at all that sketti! They had such a good time that they played for almost a hour. Anyone that has ever babysat while keeping their own kid alive would appreciate just how exciting it is when you find something to keep them both alive, not fighting, sharing nicely and mostly clean for almost a hour. It was bliss.